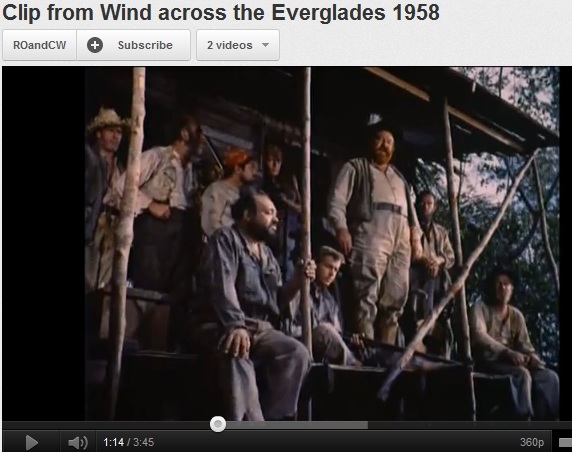 What Refer Madness is to the war on drugs, the 1958 Wind Across the Everglades is to environmentalism. That is, an oafish attempt to persuade the audience that the other side–whether they’re drug users or animal poachers–are amoral savages. What’s odd about this movie is that it was seen as idiotic even in its time. Burl Ives plays Cottonmouth, the head Irish hobos in a gang that shoots birds to sell their feathers and wrestles for which hut they get to sleep in. Christopher Plummer is the idealistic newcomer who gets hired by the Audubon Society to go after turn-of-the-century poachers. Trouble–and romance–ensue. The movie was so implausible that it effectively ended writer/producer Bud Schulberg’s career, Turner Classic Movies says. Clearly, Schulberg had hoped this would be spectacular–with Nicholas Ray as director–would have some impact. But Ray showed up under the influence of drink or drug or a suicidal woman whose bra he wore to a meeting. So Schulberg eventually fired him. At the time the conservation theme was controversial and you can imagine this movie could have been an environmental To Kill A Mockingbird. But you can hardly notice the conservation issues behind all costumes and characters that would have fit right into Gilligan’s Island. A then-famous clown Emmett Kelly and a stripper Gypsy Rose Lee played parts. I swear, there’s a guy who wears a sailor’s dress uniform and drinks booze from a coconut. Some raw nature footage is dropped into the film–as if the righteous Christopher Plummer character rows a canoe past a flock of roseate spoonbill, a swordfish, an otter, then frowns as he sees an alligator chomp down an egret. Heck, if wildlife so abundant we wouldn’t need to save it. NYC birders' patrol stops goose cull plan. Is the goose kill to protect air travelers or lawns?